NOW YOUR PANDORA COLLECTION IS BLOOMING NICELY, THE BIG QUESTION IS, WHERE TO HOUSE IT ALL? For many of us our PANDORA story began with a single bracelet, matching clips and perhaps a charm or two. Each night our precious bracelet slept either on our bedside table, a trinket dish or within the tangle of our jewellery box we’ve had since we were a teenager. Then slowly, one at a time, as each special occasion passed our bracelet was filled with meaningful charms. We start a second bracelet, buy a few charms to treat ourself and soon the addiction is well underway! Now the bedside table isn’t safe enough, the trinket dish too small and the old jewellery box is too messy. 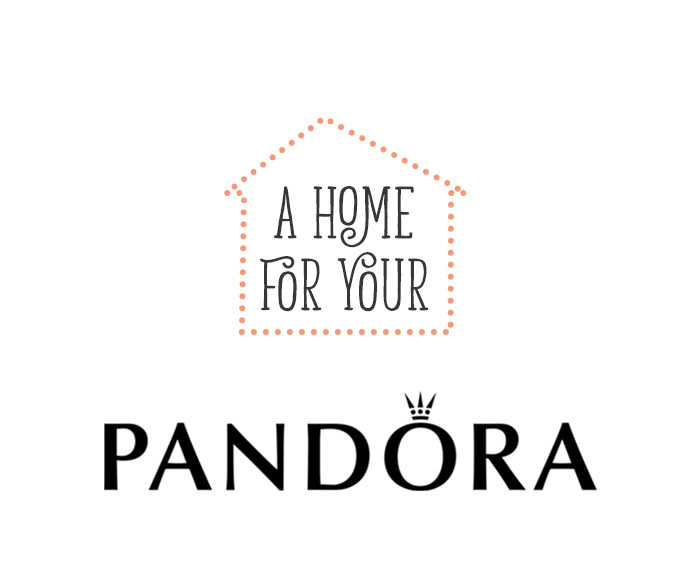 Our PANDORA treasures deserve a special home for themselves. As your PANDORA collection continues to grow and expand, it can seem impossible to locate the perfect jewellery box to house it. Here enters the Stackers concept! Made from vegan leather and velvet, Stackers jewellery boxes can be customised to suit both your taste and jewellery collection. The creative storage solution is available in a selection of delicate feminine colours such as; Blush, Duck Egg, Soft Pink and Dusky Blue. Pick from three sizes; Mini (12.5 x 18cm), Classic (18 x 25cm) and for the avid collector the Supersize (25 x 36cm). 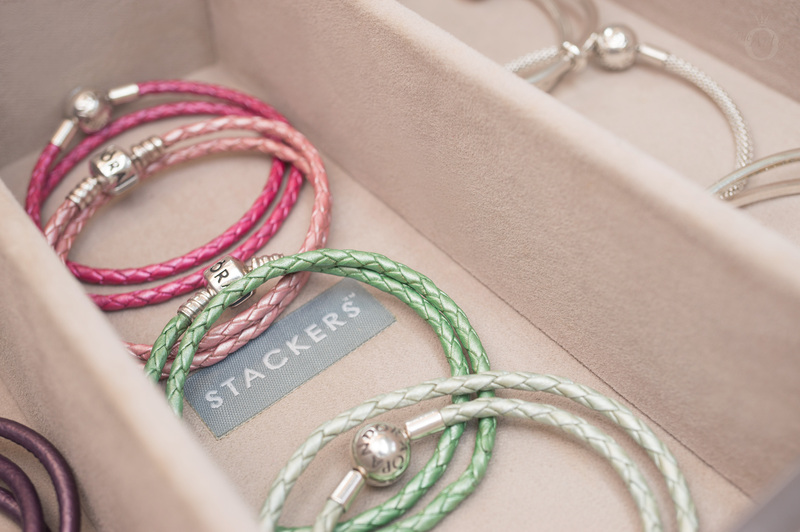 Combining chic minimalism with practical design, the stackable layers are the main feature of Stackers jewellery boxes. As well as the Lid Layer, there are also Trinket, Ring/Bracelet, Watch/Accessories, Chunky Jewellery, Charm and Necklace Layers to choose from. Once a Layer is full you can simply add another one! Experts say that our environment affects our feelings and that an organised home equals an organised mind. Some have even suggested that if everything is in the right place you won’t be running late every morning and rushing out of the door. That is yet to be proven though. After spending countless hours researching various options I finally found a home for my PANDORA collection; the Stackers Mink Classic Jewellery Box. Separated into eight compartments, the Lid Layer has a place for rings, earrings, necklaces and bracelets. With it’s padded velvet ring roll, the central section provides a secure storage for rings and those easy-to-loose stud earrings. The five surrounding trays can be used for necklaces, bracelets or larger earrings. My PANDORA Essence Bracelet, Moments Silver Sliding Bracelet, gold necklace chain, silver necklace chain and Dragonfly Pendant all live here. Their neighbours are the retired Compose Earring Hook and Barrels and the stunning Light As a Feather and He Loves Me Earring Charms. The elongated booths are superb for storing my PANDORA Moments Bracelets which I keep opened lengthwise in one and two Charm Bars sit in the second. Although Charm Bars sound like a fun place to go for a drink, they are actually ingenious little inventions! The removable bar is just the right diameter to hold PANDORA charms and provides stylish storage which doubles as useful design stations. My collection of PANDORA Clips can be found hanging out together on these two Charm Bars. The cute Clasp Opener from the PANDORA Care Kit also lives in the Lid Layer, to ensure my fingernails are protected from any feisty clips! Just as an artist gathers together brushes and paints before creating a masterpiece, or an architect alines pens and pencils prior to designing a house, it is vital for a PANDORA collector to arrange her jewellery ahead of constructing her own artistry. The Charm Layer for the Stackers jewellery box is especially helpful to design and build your PANDORA bracelet. 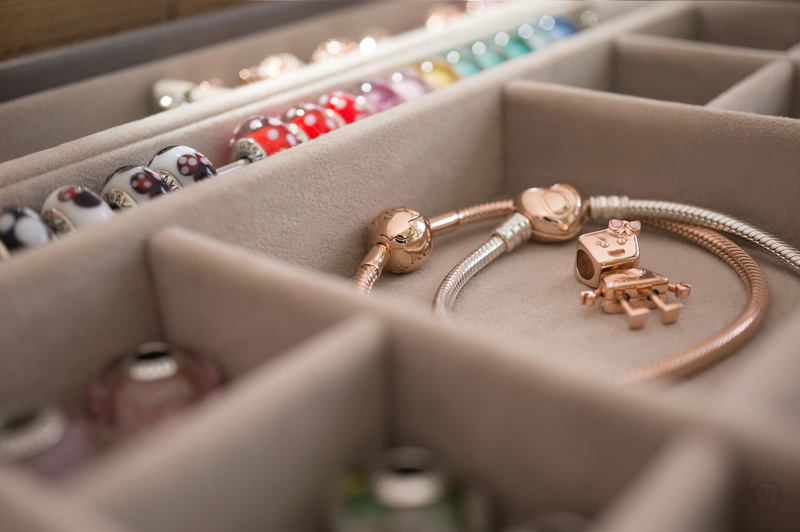 At nighttime my PANDORA Disney Murano charms sleep together in a glistening line on the built-in Charm Bar. When morning arrives, they are gently slipped off and I use the long Charm Bar as an essential tool to plan the days’ bracelet. The Charm Bar is unthreaded and beads can be added quickly at either end, speeding up the bracelet design process considerably. At the top of the layer my mini PANDORA Rose collection dwells on an additional standard size Charm Bar. Alongside, live my two safety chains, the retired Two Tone Floral Safety Chain and the adorable PANDORA Disney Climbing Mickey Safety Chain. Within the softly lined central square, my PANDORA Rose Bracelets and the darling PANDORA Rose Bella Bot are shielded from scratches. Meanwhile in the spacious apartment below the fibres of the Tassel Charms are kept pristine. Twelve smaller square compartments are excellent for categorising my Murano charms into colour groups and in one quick glance I can locate what I’m looking for. Each square can house four Murano charms if they are placed flat or up to eight if they sit on their side. Cushioned lining protects the precious Murano glass from chips or scratches. Stored safety inside three of the square cubbyholes are my little PANDORA Essence beads, glowing PANDORA Shine charms and special 14k Gold treasures. If it’s a woman’s prerogative to change her mind, then why not her jewellery? Over the years I have noticed that PANDORA collectors tend to fall into one of two camps. One group creates specific bracelets to be kept the same evermore. The second group interchanges their bracelets and charms, constantly forming new styles. As a fan who is definitely sitting in the second group, the Stackers Trinket Layer is complete perfection! Kate Spade once said, “I think that playing dress up begins at age five and never truly ends”. I for one wholeheartedly agree and believe that is one reason why I enjoy playing dress up with my PANDORA jewellery. Mixing and matching it to suit my mood or outfit for the day. Fellow PANDORA fans have inquired whether building fresh bracelets takes too much time. Of course it does take additional time compared to simply wearing your previously designed theme, but thanks to the Stackers jewellery box system, it takes a lot less time than you might think. Each cubicle of the Trinket Layer is organised into categories and sub-categories. Of course my filing system is only in my head and I’m not such a geek that I have it typed up on my laptop (yet). Some of the categories include; Vacation, Facets, Animals, Pavé, Charms in Pairs, Enamel, Openwork Two Tone, Threaded Two Tone, Hearts, Blue, Winnie-the-Pooh and Friends, Mickey & Minnie and the Disney Fantasyland Set. When I open my box of PANDORA I know exactly where to find each one of my pretties. Sometimes less is more and sometimes more is more! The customisable Stackers jewellery boxes provide storage for your every need, including awkward shaped items that never seem to fit anywhere. Larger items will still find a home in the deep and open space within the Chunky Layer, whilst the three compartments of the Watch/Accessory Layer are excellent for sunglasses as well as watches. Both Layers can be tailored to suit your need by adding the Ring Roll or Velvet Watch/Bracelet Pad. When they’re not on my wrist, my collection of PANDORA Bracelets nest together in the Watch/Accessory Layer of my Classic Stackers box. The retired Triple Leather Bracelets associate with the recent Sliding Leather Bracelet while the Double Leather Bracelets socialise in the central spot. Silver bracelets that are too wide to lodge in the Lid Layer with the PANDORA snake chain bracelets. These include the gorgeous Mesh Bracelet, chic Moments Bangle, sparkling Entwined Bangle and my go to bracelet, the fabulous Open Bangle. I love my Stackers Jewellery Box! The best part is how you can keep adding more layers as your Pandora collection grows and grows and grows. Great review! Exactly! Once you run out of space just add another layer! I also love the little houses and ring pyramids from Stackers. They are pretty enough to be ornaments but are nifty storage solutions too. Thanks for reading and commenting and have a fantastic weekend! Yes! I love that you can buy individual layers and build a jewellery box to suit your own individual collection. They are great jewellery boxes. I especially love being able to see my jewellery at a glance and quickly find each piece. I think I might need another layer soon too! Maybe one that is exclusively for my Disney items as they are taking over my collection! Fab article! I never really thought about different ways of people wearing Pandora bracelets. I like to keep mine as they are. But recently purchased another bracelet that is fast becoming my ‘charms from places I visit’ bracelet and my other one for my general charms. My daughter however does change hers up. She keeps them in a Pandora bracelet box, so this storage solution would be ideal! Stackers are a fabulous idea and I can’t wait to get one, definitely adding one to my Christmas list. While I don’t change out my charms I have different themed bracelets. I have several that represent a places I have been, a couple that is just of charms from my kids and then ones that are of just fun charms that make pretty bracelets. I was so excited when I first bought my Stackers box as in the past my jewellery was complete chaos! I love being able to see it laid out clearly, plus the deep pockets keep small charms safe. I keep all my Pandora jewelry together in a box. I leave bracelets made up with the sets of beads I like together to make getting ready in the morning quicker! It is good to be organised! I know a few PANDORA fans who design their bracelets and bracelet stacks each night ready for the next day! My name is Hannah and I’m from the UK. I’ve been using stackers jewellery boxes even before I started collecting pandora and still think it’s the best way to store my pandora. At the moment I use a three layer, mini stackers box in white which I think is ideal because there is lots of room for all my charms and bracelets. I prefer to wear new jewellery designs every day but I do have three bracelets which don’t change: a rose gold bracelt, a silver essence bracelet, and a rose gold essence bracelet. You are right, Stackers is great for storing PANDORA and in my opinion the best way too. I do like the PANDORA jewellery boxes but I love all the possible options that Stackers offer. Thanks for commenting and have a fabulous weekend! Omg!!! I really love one this jewellery box from stackers. You’re right, the Stackers boxes are really beautiful and they are available in such gorgeous colours too. I love the blush colour with pretty rose gold coloured trimmings. Stackers also offer a personalisation service which would be lovely for a gift. I definitely recommend it! Not only will it be prettier than a bag but your jewellery will be a lot safer too! I keep all my Pandora in a Pandora’s box, but it is not big enough. I have always wanted a Stackers box as you can personalize it depending on your needs, so it would be perfect in all ways, for complete bracelets, for projects, for charms. Rings, every layer for every kind of jewelry! The Stackers jewellery boxes are an excellent way to organise your jewellery. Not only can you custom design your box for your own needs, Stackers also offer a personalisation service so you can have your initials monogrammed onto it! It seems essential to have all the charms ordered and these jewelers is the best way!!! 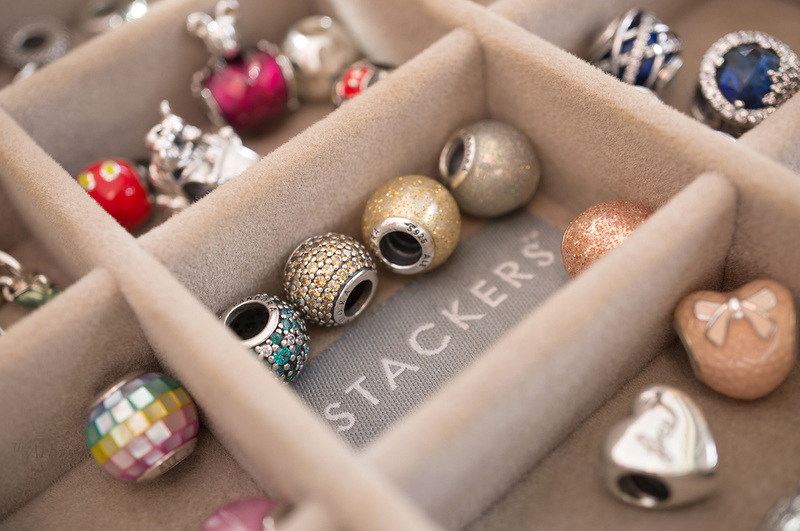 You are right – the Stackers boxes are perfect for organising PANDORA charms. It makes it so much quicker to find each charm and the little sections stop the charms from getting scratched or lost. I definitely recommend Stackers jewellery boxes for organising your collection. The Accessory Layer is great for keeping bracelets that are already made up and the Ring/Bracelet Layer would be good for you if you have lots of stud earrings. The Travel Case is very pretty and it is a good size. Large enough for the necessities and small enough to fit in a hotel room safe. I hope you have a fantastic time on your cruise! Oooh I love the sound of your striped Stackers boxes! That is a genius idea! My PANDORA collection has pretty much taken over my Stackers box. There are are a couple of non PANDORA rings in there too and one necklace but everything else that isn’t PANDORA has been kicked out. Maybe once I get another layer there will be more space but like you I also like to keep it separate. Thanks for commenting and sharing your ideas. I’m glad I helped you to make up your mind! It took me a while to decide which route to take too but I’m really pleased with my Classic Stackers box. Remember to use the code ‘dora10’ for a 10% discount if you place an order with Stackers. 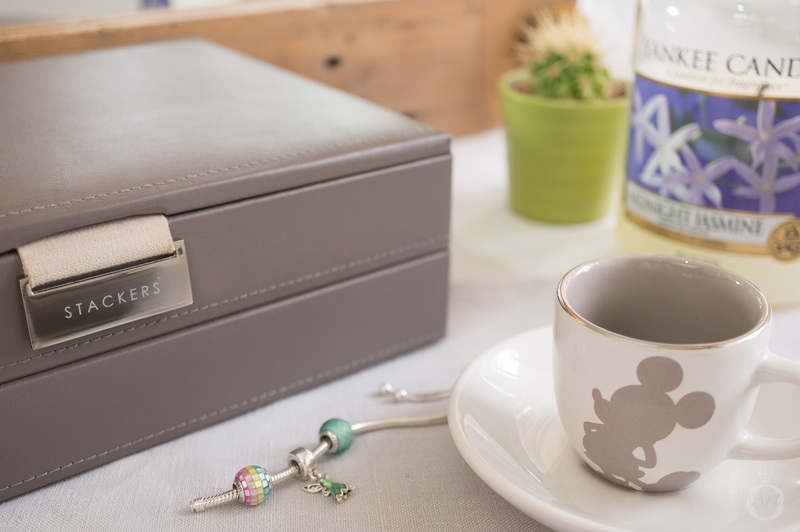 I use my stackers jewellery box for storing my pandora bracelets and jewellery. Ive been collecting for a while, so keep all my beads on bracelets and bangles in sets, a christmas set, a valentines heart set, a floral set etc etc etc. Love the variety of stacker boxes that you can get too! Thanks for sharing how you organise your PANDORA collection. It seems that a lot of fans prefer to keep their bracelets in the same design, it definitely saves time. Stackers also have some cute storage options for the home. The House Trinkets are super cute and I am really tempted to get the Stackers Clutch Bag, it looks so chic in the blush colour. Hi Dora, great blog! This is @FierceZhai from Youtube & Instagram. I really love PANDORA jewelry and I’ve been collecting PANDORA since September 2017. I have a lot of charms, rings and earrings, and I need to find a beautiful home for them! Beautiful jewellery deserves a beautiful home right? I really recommend the Stackers jewellery boxes for your PANDORA collection, especially as it grows. Thanks for reading and commenting and enjoy your day! Mi piace la Pandora e la colleziono dal settembre 2017. Nessuno può chiedere per i suoi gioielli una confezione migliore di un portagioielli della Stackers: qualità, bellezza e praticità allo stesso tempo! Bei gioielli meritano una bella casa, giusto? Consiglio vivamente le scatole di gioielli Stackers per la tua collezione PANDORA, soprattutto man mano che cresce. Grazie per aver letto e commentato e goditi la tua giornata! Thanks for your comment. I’m so glad you enjoyed the article and it has given you some ideas. When you make your hints to your friends remember to mention that you can get a 10% discount with the code ‘dora10’! They really do have a gorgeous choice of colours. The range for men is lovely too. Creating jewelry that represents a special moment in your life is spectacular. Seeing these memories brings a smile to my face. Thank you! That is so true. My recent PANDORA Disney Parks purchases make me smile as I remember my first Disney Park experience! It was incredible! Thanks for reading the article and sharing your view with us. IG skin8219 E’ perfetto per i miei tesori Pandora, dai bracciali ai charm ogni cosa al suo posto. HI my name is Federica and I live in Italy Rome my instagram page is skink8219. I Have many Pandora charm so I’m searching the perfect HOME for my collection I think that mystackers is perfect for me. Thank you for your lovely comment. I’m so happy you enjoyed the article. Your jewellery box sounds perfect for you! The original PANDORA jewellery boxes are very hard to find now so you did well to get two for a good price! Stackers do offer shipping into Europe and deliver to Spain for £12.95 or provide free delivery if your order is above £95. The delivery takes between 3-4 days. Je viens juste de reçevoir mon premier bracelet Pandora et ses charms. J’ai acheté une jolie boite carrée Stackers pour stocker tout ça. I love my Stackers box to store all my Pandora beads and bracelets. Such a good quality. Yes the Stackers boxes are perfect for PANDORA. I especially love the charm bar as it really helps me to design my bracelet themes easily. Thanks for reading the article and commenting. Thank you for your lovely comment! I am so pleased you enjoyed reading the article. I definitely recommend a Stackers box for your PANDORA collection, it makes it so much easier to see all the charms and plan what to wear. I used the green PANDORA travel case on my recent vacation and it was too small and made me realise how much I love my Stackers box!